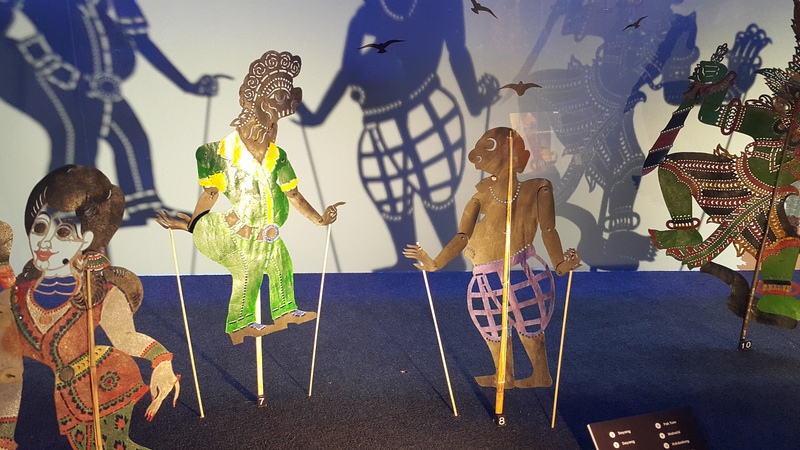 Muzium Negara has, in its collection, around 500 wayang kulit (shadow play) puppets and 200 of these are currently on display at an exhibition titled ‘Symbolism Behind the Screen’. There are also puppets on loan from Fusion Wayang Kulit that depict characters from comics and science fiction. 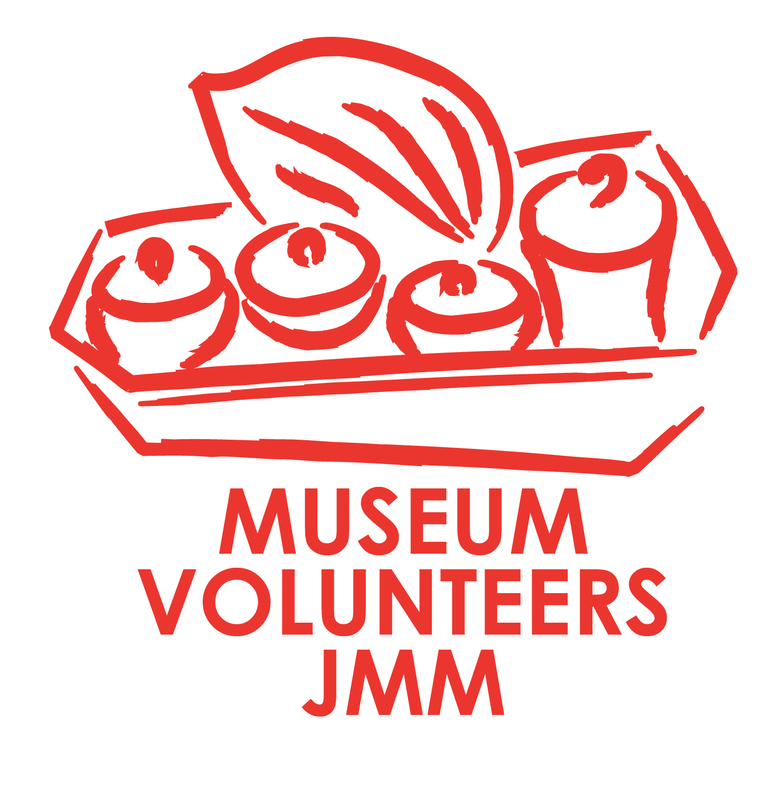 Do take the time to visit the exhibition which runs until 28 February 2017 at Muzium Negara. 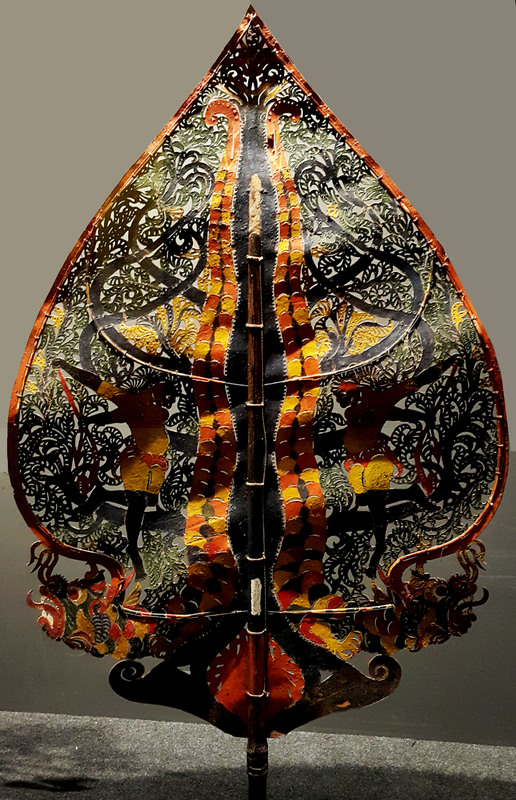 In a wayang kulit performance, the puppeteer (known as Tok Dalang) manipulates the puppets in a raised hut which has a white screen stretched across the front hiding him and the puppets from view of the audience. A lamp behind the puppets casts shadows on the screen and this is the basis of the performance. The wayang kulit is considered a microcosm of the universe while the Tok Dalang, manipulating the puppets, is taken as symbolising God. Dalang means ‘priest’ in Sanskrit; the Tok Dalang was also trained in magic rituals and many dalang functioned as bomoh or practitioners of Malay magic. In fact, in days gone by, the Wayang Kulit was not just a performance art but was also used in spirit exorcism ceremonies. In the wayang kulit universe, the sun is represented by the lamp while banana trunks, used as a resting place for the puppets, represent the earth. Humans perceive the universe through the screen. Behind the screen. The diorama shows the Tok Dalang in the process of placing the puppets on the banana trunks. The ‘good’ puppets will be placed on the trunk on this right while the ‘evil’ puppets will be placed on his left. Perhaps the most important prop is the pohon beringin (tree of life) which represents all life in the universe. This tree, seen both at the start and end of the story, symbolises the start of the universe and the end of the world. The tree is divided into three parts: the top represents the sky and includes motifs of birds, the middle represents earth and includes animals, while the bottom represents the supernatural world. A touch-screen kiosk at the exhibition provides substantial information on the symbolism behind the rituals conducted before, during, and after a performance. For example, a feast is held during the ‘theatre opening ceremony’ in order to ensure the performance goes well. During this time, the musical instruments are blessed so that they will succeed in attracting and holding the attention of spectators. An offering consisting of 25 items placed on a large tray is also made. 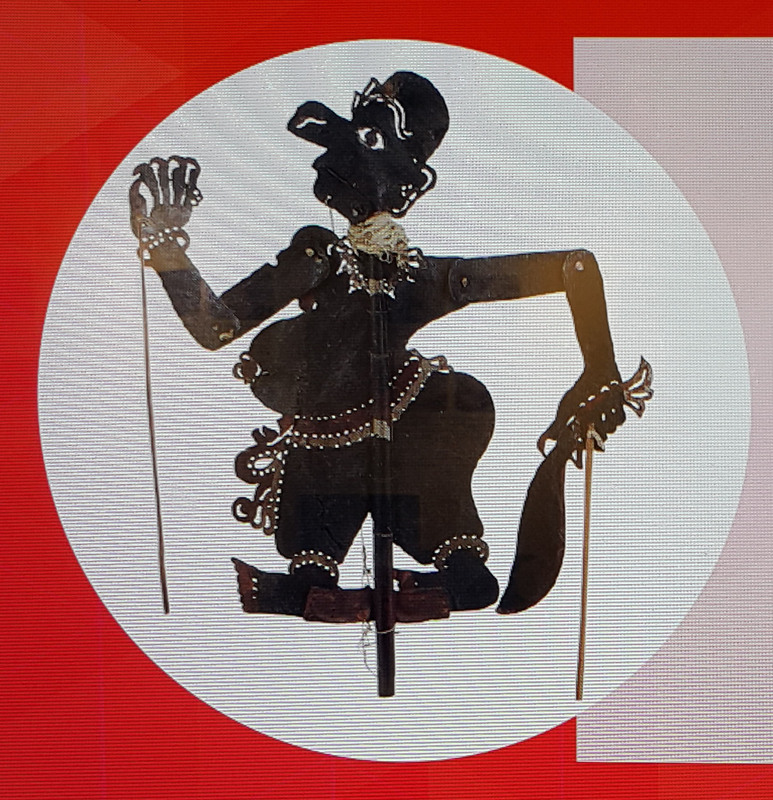 Pak Dogol, a Kelantan Wayang Kulit character that bears similarities with the Javanese Semar. This character is portrayed with a shaved head and a prominent high-bridged nose. His only clothing is a pair of long trousers which does not cover his distended stomach, thus revealing a protruding navel. He carries a parang golok. Apart from the conventional wayang kulit characters, i.e. 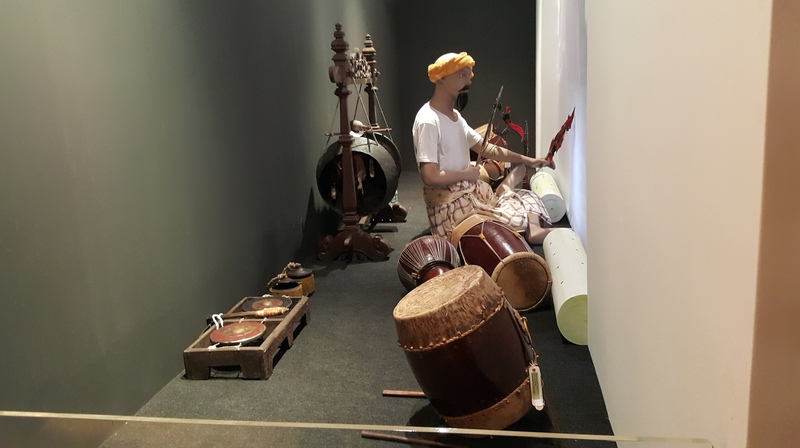 Sita Dewi, Sri Rama, Hanuman, and Ravana, the exhibition also displays a host of other puppets including demonic and animal characters as well as the Punakawan (e.g. Semar) that provide comic relief. Wayang Kulit’s foray into science fiction started with the the production of the ‘Peperangan Bintang’ performance inspired by the Star Wars movies. Its success spurred a new line of puppets including Superman, Batman, Wonder Woman, and Flash. These are also on display.